A couple of days back, we knew that Samsung Galaxy S9 and S9+ would launch at the MWC 2018 and this was confirmed by the CEO of the company himself. We have seen a ton of leaks related to both the phones and today; we might have got one of the biggest and a ‘Legit’ leak of the Galaxy S9. The retail box of the phone has leaked in the image that reveals major specifications like the cameras, display, memory, etc. Among all these specifications, the camera specs are surely going to amaze you as Samsung is bringing next level camera technology with its S9 and S9+. 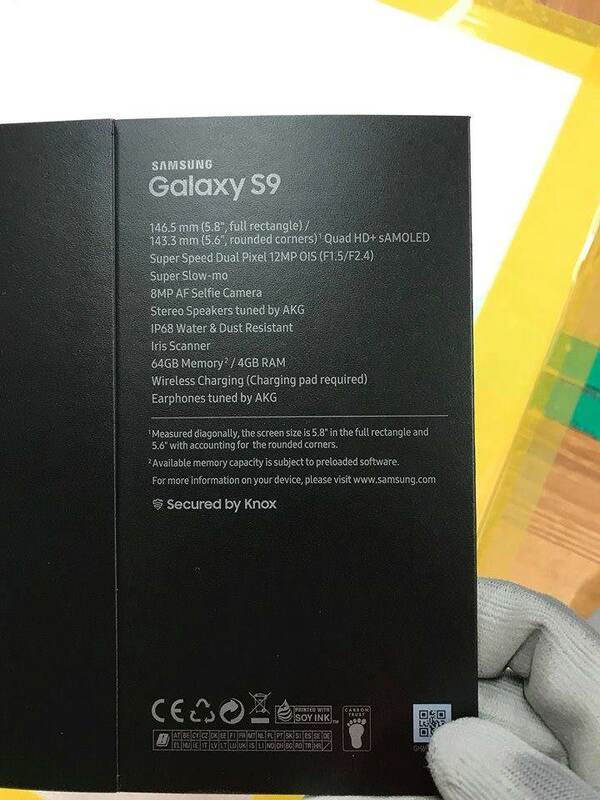 Revealed by a user on Reddit, the retail box is legit for sure, and as per the image, the Galaxy S9 has a 5.8-inch dual curved Quad-HD+ Super AMOLED display. There is 4GB RAM and 64GB ROM which suggests that 6GB RAM is for the Galaxy S9+. It is also rumored that Samsung Galaxy S9+ is coming with a 512GB ROM model also which is impressive. Coming to the cameras, there is a single 12MP rear camera, but the amazing thing about the camera is that it has a variable aperture (f/1.5 and f/2.4) so that it can mechanically open and close, just like on the Samsung W2018 that launched in December last year. The retail box mentions ‘Super-Slow-Mo and ‘Super Speed Dual Pixel rear camera’ which suggests the camera on the phone is surely going to impress, especially in the slow-motion video recording. On the front, there is an 8MP camera with AF. The phone is IP68 dust and water resistant & also has Iris scanner and Wireless charging. Another great thing is that the phone has stereo speakers that are tuned by AKG. Some other things that we know include Snapdragon 845/ Exynos 9810 processor, Bixby Assistant, and 3.5mm headphone jack. There are no details about the pricing yet so stay tuned.